Five police officers were recently found guilty of neglecting their duties after a convict ran a drug dealing business while he was serving his sentence in a detention center in Jiangxi Province. 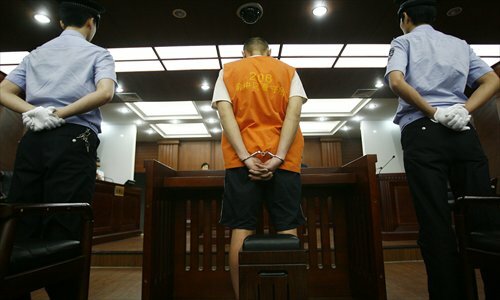 The convict, Huang Xiaochun, was given three and a half years behind bars by a local court in December 2010 for dealing drugs, but did not serve his sentence in a prison. He stayed in a detention center despite the provincial public security department stating that convicts who face a jail term of more than one year or are guilty of serious crimes such as drug dealing must be transferred to prison. In the Zhangshu city detention center, Huang was able to use a cell phone and laptop, and he continued dealing drugs for a year after his conviction with the help of five police officers and was also involved in a secondhand vehicle business. After the case was finally exposed, Huang escaped from the detention center, and was then arrested again. He was executed for drug dealing and illegally trading guns and ammunition in 2014. After the local court handed down the 2010 verdict, Chen Xiaotao, a senior officer at the detention center said in a staff meeting that Huang was his relative and he asked other detention center officials to allow Huang to serve his sentence in the center. The head of the detention center eventually agreed and helped Huang with the approval procedures. But being able to stay near his relative was not Huang's only purpose. Soon after Huang asked Chen to buy every police officer in the center a meal to build his relationship with them. Huang bribed a police officer surnamed Xu with 10,000 yuan ($1,561) and requested to work in the center's shop, as this area was not tightly supervised. Using this opportunity, Huang obtained a Samsung smartphone and a computer from an outsider. Moreover, Huang was allowed to leave the center as he pleased. "During the detention period, if there was something urgent near the center that needed to be dealt with, I only needed to inform the police and I could leave," he said. Using the phone and computer, Huang started to build up his criminal network and turned the detention center into his base of operations. Huang would contact the dealers and then arrange for others to pick up the drugs and get the money. Wang Xiaohua was Huang's girlfriend. She met Huang outside the detention center in 2011 and did not know Huang was serving a jail term until they met for the fourth time. "Huang came out to meet me almost every day and normally he would drive," Wang said. Soon Wang started to help Huang. She recorded all the illegal transactions online, with details including the amount and types of drugs sold, customers' names, dates and profits. This all went on despite the fact that the detention center forbids detainees from leaving the center and meeting visitors privately. Also, electronic communication devices are not allowed. Although these regulations seemed to not apply to Huang, his illegal business did not last long. On June 22, 2012, Wang was arrested by local police after she finished a deal which included three bags of methamphetamine, a bag of cannabis, a rifle and 28 bullets. Huang, after failing to reach Wang, told a police officer working at the center that he was leaving to buy groceries. But he did not return. Huang was later arrested and executed in 2014. The five detention center officers, including the center's head were all found guilty of neglecting their duties in April. The Zhangshu center is not the only penal institution that has been found to have problems. After Heilongjiang Province's Nehe prison scandal was exposed in January, in which a prisoner reportedly used phones to blackmail several women, Yunnan Province's department of justice investigated 31 prisons and 14 rehab centers. More than 10,000 prohibited objects were found.